The year was 2003, and I was a mere ____ years old living in Hawaii with my husband, Rob, when we got word of a close-enough lava flow on the Big Island we just HAD to see. So, we flew over, hiked only about a mile, and wouldn’t you know it? There is was. Lava flowing right by our shoes, as we watched bystanders pick at the 2,000 degree lava with sticks (and, subsequently, watched those sticks ignite). Looking back, it was one of the most amazing sights I’ve ever seen. But, now that I’m a few years older (and may I add, wiser? ), I realize how dangerous the experience really was. Seems like deja vu all over again, as this year’s Big Island lava flow entices thousands of visitors to see the Earth forming right before their eyes. 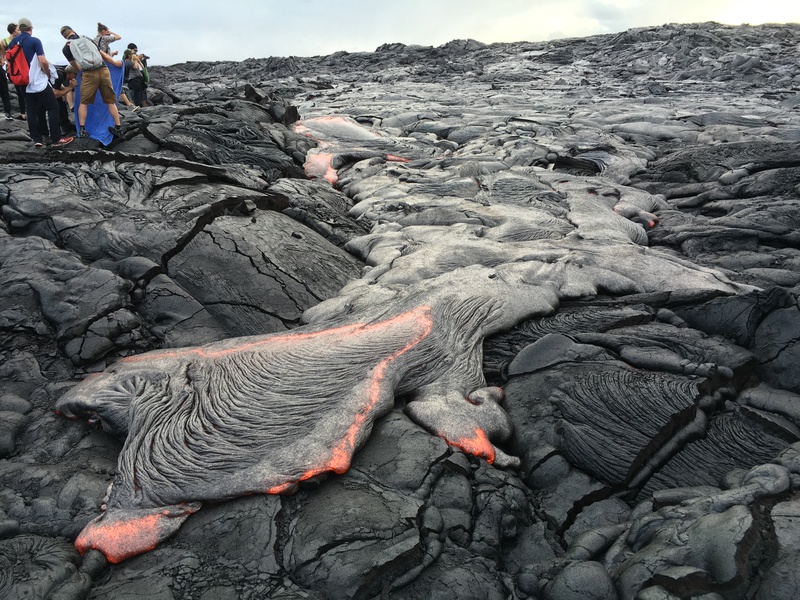 But, officials are urging caution — you need to be EXTREMELY careful when viewing the lava because as beautiful as it is, the flow is also quite dangerous. “Active lava is really one of those bucket list type things. People want to see active lava flows and with the National Park, part of our mission is to provide safe access to active volcanism, and with this current eruption we’re able to do that,” Jessica Ferracane, a spokesperson with the Hawaii Volcanoes National Park, told Hawaii News Now. Officials are asking any one heading to the lava flow to prepare with hiking shoes, long pants, a long-sleeve shirt and gloves, in case you take an accidental spill. They say falling on the fresh flow is like landing on shards of glass. They're also recommending individuals bring at least a gallon of drinking water. Officials tell the news station that 4,000 – 5,000 visitors pass through on a busy day. At least 1,000 of them are making the nearly 9 mile trek round trip on bike or by foot to Kamokuna, the area where the lava flow is entering the ocean. But, there are few safety boundaries, and park ranger patrols are limited, so anyone who heads this way is doing so at their own risk. And, those risk-takers are being tempted by… you guessed it: The Internet. According to Hawaii News Now, Since “61g”, as its informally being called, crossed the Chain of Craters Road and entered the ocean on July 26, social media has been flooded with some daring attempts to get close to the amazing display. “Hot flowing lava is like a hot stove. Your instincts are not to pet the lava, not to touch that hot stove. Most people aren’t going up and putting their hand on it. It kind of creates its own safety shield,” Ferracane told HNN reporters. Still, officials say there are still serious concerns. Lava entering the sea builds a platform of new land known as a lava delta. “Lava deltas are deceptively stable looking. You see it and think, ‘Gosh, that’s the place I need to be to see lava up close and personal’, but the near lava is hiding a foundation of rubble that is extremely unstable,” explained Janet Babb, a spokesperson with USGS Hawaii Volcano Observatory, to the news station. 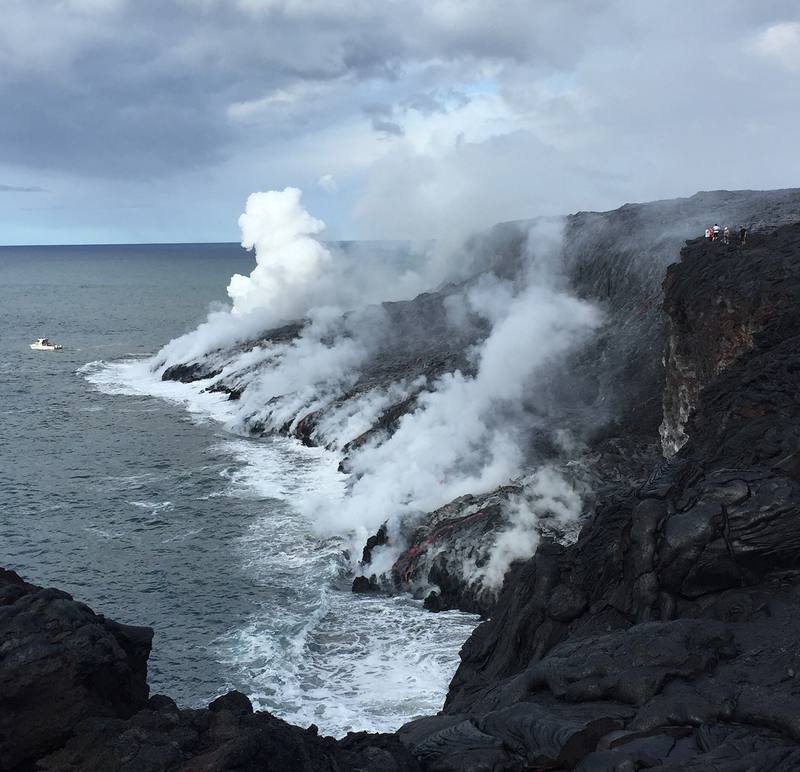 Experts say when the hot lava and cool sea water interact it creates steam explosions laced with hydrochloric acid and pieces of volcanic glass. “We talk about concerns for people on shore, but it’s equally hazardous for people on the water because if a delta collapses and an explosion occurs all that debris is going to be blown out in all directions,” Babb told HNN reporters. Since the latest flow has been visible, thousands of visitors have flocked to see it. However, officials are urging visitors to be careful because the ground next to flowing lava can be unstable. So, how can you enjoy the Big Island lava flow without putting yourself in harm’s way? Be smart. Officials are asking any one heading to the lava flow to prepare with hiking shoes, long pants, a long-sleeve shirt and gloves, in case you take an accidental spill. They say falling on the fresh flow is like landing on shards of glass. They’re also recommending individuals bring at least a gallon of drinking water. Or, instead of hiking to the lava and risking a fall, take the safer route and book a Big Island Helicopter Tour through Hawaii Aloha Travel, and see the volcano’s grandeur from an aerial perspective. However you view the lava, the most important thing to consider is safety because, as with many of nature’s wonders, the most beautiful sites are also the most dangerous to enjoy.